During Soviet Epoch OSVOD was a voluntary public lifesaving organization. The society’s aims are to prevent accidents, to cooperate in teaching the population, especially children, to swim and perform rescues, to assist the rescue service in every way, to regulate the use of small boats by amateurs, to develop new models of rescue equipment, and to work out problems of water rescue. 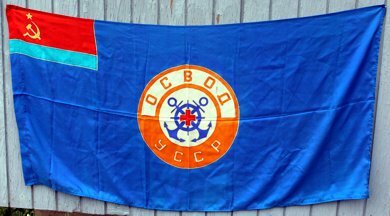 "An Old Authentic Soviet Ukraine BIG SILK FLAG of the OSVOD Soviet Union Water Rescue - Lifesaving Society with Communist Star and Sickle & Hammer Emblem. Inscription: "Os (Society)Vod (Water). USSR (Ukraine Soviet Socialist Republic)" Dimensions 70" x 36" (178 x 91 cm). Made in USSR circa 1970 of silk. Good condition - see photo for all details." [The inscription] more correct: "O (Society) S (Lifesaving) Vod (Water). USSR (Ukraine Soviet Socialist Republic)"